Buratino's Adventures in Azerbaijan State Youth Theatre of Young Spectators buy tickets online. Delivery of tickets for the event Buratino's Adventures. "Buratino's Adventures" (Two-part musical adventure) Age Limit: 6+ Author: Aleksey Tolstoy Acting director: Ivista Simich (Croatia) Starring: Asya Atakishiyeva, Elshen Charhanli, Anar Seyfullayev, Gulbeniz Mustafayeva Genre: fairy tale and performance Duration of the performance: I part – 45 min II part – 45 min The story of a wooden man that attracted the attention of many writers of the world has been used in dozens of versions. An alone old man makes a person from the wood and it transforms into a living being and begins to live a human life. 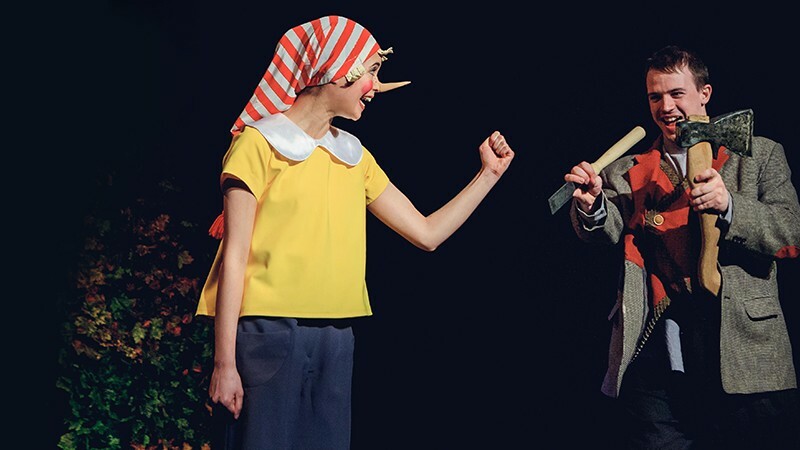 This fairy tale staged in our theater also attracts attention with its dynamics and adventures. Tolstoy shows the hardest aspects of the life to his wooden son - Buratino. He undergoes very difficult tests to bring the goldenkey to his father. Buratino remains devoted to his father Carlo, who made him from the wood, promises him to be clever and well-bred and attend school. The theater actors and people with different traits explain him thathardwork, talent and wisdom must be the best friends of the person. Respect for the elderly, and their wise advice sheds light on the children's path. Namely with such traits Buratino opens doors of the treasure to the Carlo father and helps him to found a new theater, and brings around talented unemployed actors.